June Venus, the leader of the team which visited these shores last week, conducted a series of drama, music and arts workshops at the Rose Hall Primary School, Troumaca and Petit Bordel Secondary Schools on the countryâs Leeward coast, and the Bishopâs College in Kingstown. Venus, working on behalf of the Cambury County Council in England, said that the project was designed to build international links as well as trade learning and teaching styles between teachers and students of the different cultures. The team included three other teachers and 14 students. The students, both local and international, were identified as gifted, talented and creative, who will more than likely slip through the âacademic netsâ. It is hoped that programs such as the one conducted would encourage them to continue academically while developing life skills. A primary school head teacher, Venus noted that despite the great cultural divide, there were a number of similarities which drew the children and teachers together. Venus said that the students plan to continue communications through other media when they return home, and will engage in fund raising drives in an effort to have Vincentians students travel to the United Kingdom in the near future. 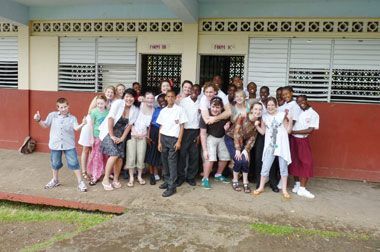 Following their workshop at the Bishopâs College, the visitors were treated to a cultural presentation, which featured steel pan and choral speeches.